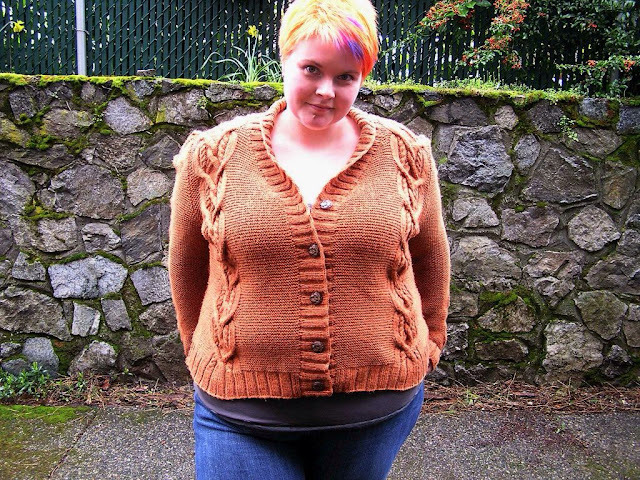 I finished this cozy cardi in January or something, but only just got the pictures taken (thanks to my awesome photographer, a fencepost and an auto-timer) to prove it. The pattern is Monami by Emily Johnston. You know, I've only ever knit two patterns in anything like the recommended colour. Both have been Emily Johnston patterns. Apparently she has awesome colour and design sense, just like me (read that with a little bit of tongue in cheek, yes?). I used Knit Picks Swish DK in the Persimmon colour (discontinued now), which was a pleasant experience overall, although the feel of the yarn is ever so slightly plasticky on the needles. The finished product, however, feels lovely and soft, and is pilling only moderately considering both the softness of the merino and the frequency of wear. This is a perfect rainy day sweater. It is warm and heavy, like a wooly hug. I love it. 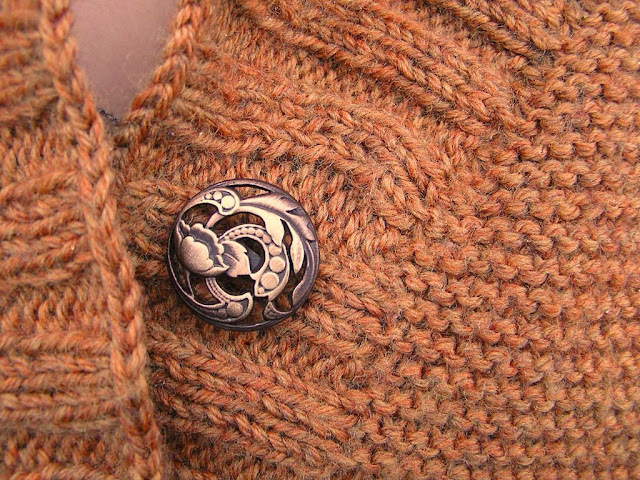 The buttons are pretty amazing too - they're from the Button and Needlework Boutique in Trounce Alley, and they're gorgeous. I did modify the pattern a fair bit. 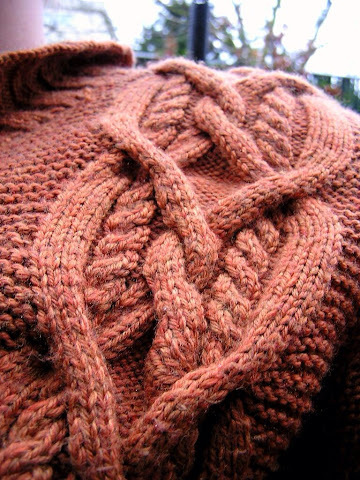 I began decreasing for the neckline on the same row as the armholes, taking out one stitch every second row until the cable chart was at the neck edge. I think I also buggered around with the waist shaping a bit, so it would be slightly higher. I knit a 3x3 rib button band and a shallow shawl collar, which I really don't like, in hindsight. I should've knit a much deeper collar. Right now I am waffling between ripping out the bind off and increasing the collar depth so it folds over properly, and just tacking the collar down so it stays in place. Until I decide, the sweater is perfectly wearable, so there's no rush. What do you think? fix it, or fudge it?